When we moved down to Antalya, I smelled the flowers for myself. It was autumn, so these would have been nascent winter oranges. We had gone to the market in Kumluca to buy vegetables. Back then, our trips to the Friday market were pretty much the only time we left the garden all week, so it was necessary to be very attentive of what we bought, since it had to last us. As I wove through the rows of vegetable stands and tried to keep Baki from getting his hands into everything, though, I kept on catching a heady scent on the air. What was that delicious smell? It was surely, I thought, a white flower, but it was not one I had ever encountered before. Finally, I strayed to the very edge of the market and found myself staring into a small orange orchard in the yard of a house that abutted the marketplace, inhaling deeply. So that, I thought, was what my mother had been talking about! If you talk oranges in Turkey, people immediately think, “Antalya.” At sea level, anyone who has a commercial orchard plants citrus fruits. Up by us, a mere 500 meters above sea level, the preference is pomegranates – citrus fruits will grow here (we have lemons on our trees at last!) but they do not thrive, as they shrink from even the half hearted frosts and gusts of chilly wind from the mountaintop that we get here. 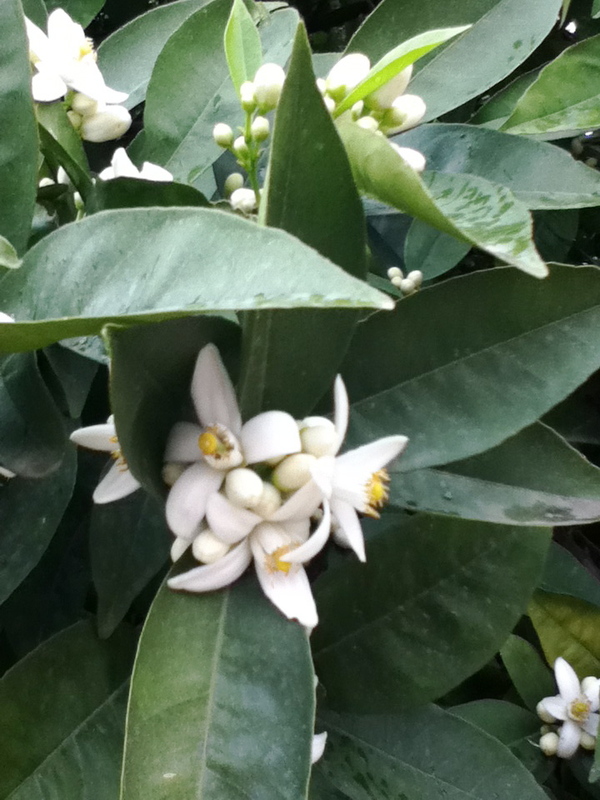 Still, twice a year we are surrounded by the smell of orange blossoms whenever we go down. It’s not an easy smell to describe, but I would liken it to such extravagant pleasures as eating marzipan, or enjoying the warm hug of a cashmere sweater on a chilly day.